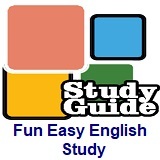 ﻿ Fun Easy English - new american english study Voice of America VOA Education Tips Avoid Ineffective Study Methods lesson. Imagine you have a test in school. It could be for a class in history or mathematics. Even worse, you could have an English test. How should you prepare for this terrible event? What can you do before the big day to help you do better? Should you reread your history or math books? What about underlining important words or sentences? If you are like many students, you probably use both rereading and underlining. But are these truly the best methods? Today, on our Education Report, we will explore effective and ineffective ways to study for tests. You might learn that some study habits you used in the past might not be the best methods. Are rereading and highlighting effective? Rereading and highlighting are common strategies that you will see in schools around the world. Students look at information they have already read in an effort to remember what is important. Students often combine rereading with highlighting. They underline important information in what they read with a writing instrument such as a marker. American Mary Pyc is a cognitive scientist. She studies the human mind and its processes. Pyc says that both rereading and highlighting are ineffective study tools. While better than not studying at all, she believes they are not as useful as other habits. "For example, with rereading, it's maybe not as effective because you are not trying to actively retrieve the information. You are not seeing "what do I actually know about what I read?" With rereading what is going to happen is that it is going to feel like you already know the information because you've already read it. So, you have this sense of fluency that is leading you to think "Ok, yes, I know the information." The problem with highlighting, Pyc says, is that students have a false sense of understanding - similar to when they reread information. Also, there is a second problem that comes with highlighting. "Students aren't always aware of what the most important information is. So it's possible that they are maybe highlighting details that aren't as important as the higher level concepts." So what should you do if rereading and highlighting are not the best ways to study for a test? One idea is to test yourself. We have discussed self-testing strategies in other education stories. Simple flashcards and practice exams can help when you want to make sure that you have learned something. Another strategy is what education experts have called “spaced practice.” This means to practice remembering the new information over time, instead of doing everything all at once. We will discuss spaced practice in a future Education Tips story. Regardless of which strategy you chose, you should know that effective learning takes time and it takes effort. The next time you have a test coming, try to plan for the big day so that you can give yourself time to engage in different study habits. And remember, rereading and highlighting are better than not studying at all, but there are better methods out there! Write about this in the Comments Section below.